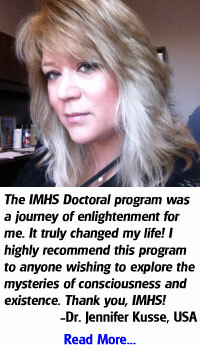 IMHS is a premier metaphysics school that offers online metaphysics Bachelor's, Master's, and PhD Doctoral degrees, parapsychology degrees, life coaching degrees and certifications, spiritual counseling degrees and certifications, metaphysics certificate courses, metaphysics classes, life-skills courses, paranormal investigator certification, relationship courses, leadership training, hypnosis degrees, hypnosis certification, Reiki classes, Tarot classes, and more. 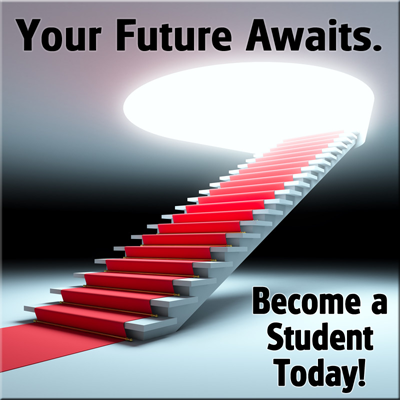 Affordable tuition plans available. 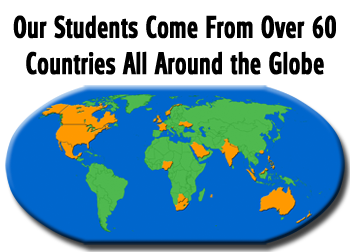 All metaphysical distance-learning, online courses, and metaphysics degree programs are self-paced. 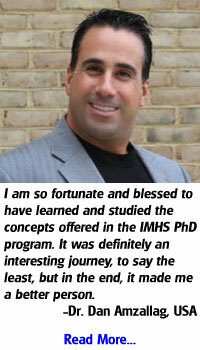 The Institute of Metaphysical Humanistic Science (IMHS) is a premier online and distance learning university that offers high-quality Doctorate/Doctoral PhD Metaphysics Degrees that will enhance your life and career even if your career is not in the metaphysics field. Metaphysics is about more than just the abstract; it is also about a successful life. The abstract will certainly stimulate your thinking and can lead to great spiritual development, but for spiritual development to be effective and meaningful, it must be activated by practical life-skills; powerful everyday tools that will enable you to have better relationships, better communication skills, better critical thinking skills, and more. 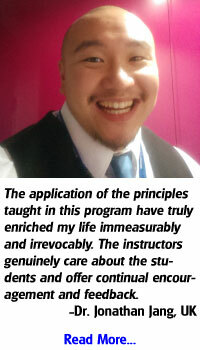 IMHS gives you both the spiritual development and the practical life-skills you need for a balanced, successful life! 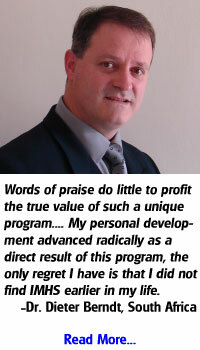 The IMHS curriculum is based on the Life Leadership ParagonTM, an exclusive and elegant model for success that has changed countless lives for the better. It is only taught at our schools. For more than a decade, this model has been carefully crafted and developed into a powerful, cutting-edge system for personal growth and spiritual enlightenment. The Life Leadership ParagonTM also serves as the foundation for Life Leadership CoachingTM, a blend of life coaching and transpersonal spiritual counseling which is also only taught at our schools. Students specializing in Holistic Life Coaching or Spiritual Counseling will really appreciate this creative and highly effective approach to helping others! In addition to spiritual development and practical life-skills, IMHS actually gives students the skills they need to be successful in their chosen areas of specialization (major). Many of our students take additional courses in their areas of interest beyond the ones required for graduation because they have come to know that our courses are comprehensive and beneficial to their personal and professional development. 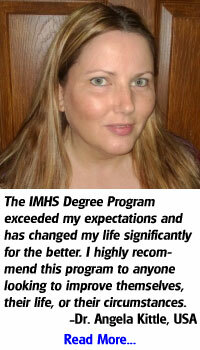 IMHS graduates are well-equipped to go out and make a positive difference in the world! Rather than obscure, fringy, and highly esoteric concepts, IMHS approaches metaphysics in an objective, grounded, and real-world manner while still keeping the door open to the great mysteries of consciousness and our Universe. As humanity evolves, many people are leaving the confines of old religious and social notions and seeking new paradigms that focus on the value and worth of the individual. This is why IMHS teaches a human-centered spiritual philosophy which does not surrender one's power to anyone or anything else. It empowers, encourages, and builds people up. It refreshes the mind, spirit, and soul! Our degrees are absolutely genuine, legal, and "real." 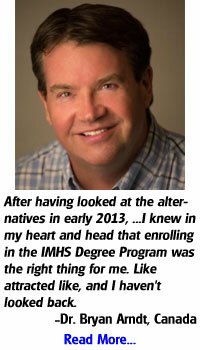 IMHS is not a diploma mill. Our degrees are non-secular (religiously-based) in nature and require effort on the student's part. Non-secular degrees are neither better nor worse than traditional degrees; they are simply used for different purposes. Therefore, students can rest assured that the degree they earn is completely legal and "real," and the title of "Doctor" can be used in front of their names. This applies to nearly every country in the free world--especially countries that protect religious freedom. With the many demands of life in this day and age, most adults simply do not have the time to spend several years getting a degree. Nevertheless, many busy adults would like a degree to enhance their lives and careers. Therefore, we have simplified and streamlined our Metaphysics PhD program by offering Bachelor's, Master's, and Doctoral degrees in an accelerated format that takes less time to complete thus allowing students to begin using their degrees sooner. And the best part is that our degree program provides an excellent learning platform that is concentrated, comprehensive, and affordable. We think you'll find this 21st Century approach to getting your Metaphysics PhD degree a refreshing change from the past century!